As a homeschooler, my boys have had the advantage of being taught as youngsters that the Bible is the inerrant Word of God, thus creation is just as the Bible says it is, not full of evolution. We have been able to firm up a foundation for them on how science is created by God and that the two can work in harmony together. This was the first year where my oldest was exposed to community college teachers who felt differently. Evolution is rampant in the school, from English to Psychology class. The 'educated' teachers made it very clear that my son was in the wrong, and their way was right. What to do when a teacher makes you feel as if you are immature for believing that God is the ultimate creator? You read a book like on the seventh day! 40 educated, some very educated scientists and other academia share their personal testimonies on how they believe in God as creator. This was a very refreshing look at a variety of people, female and male, from the UK, USA, Australia and more, who share their personal reflections on God. A few of them were a bit too scientific for me personally, but others were down to earth, simple testimonies of how they can connect their wisdom from God. Great encouragement for teens and adults in the world today! "For all their intellectual gifts, those with PhD's are hungry for the same thing the rest of the population seeks; peace and spiritual fulfillment. Some hide behind a cool, clinical exterior, yet grapple with internal insecurities, fears, and disappointments. The scientific mind is eager to find truth; indeed, the very pursuit energizes scientists from a plethora of disciplines and backgrounds. This book was compiled for them. It contains not only "scientific" inquiries into the miraculous, but personal and poignant travels on the road to serenity. Scientists who gaze at the heavens, and peer at microscopic creatures to better understand the world in which we live. 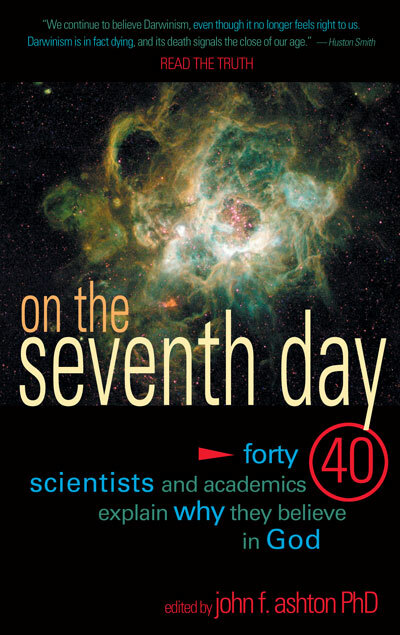 If you are a friend who wants to introduce your scientist friend to God, then you've found the perfect gift with On the Seventh Day. If you are a skeptic, have a read. You'll be amazed that you've taken this path in your search for truth. In this book, you too can find rest from this hard business called life. 51/2 x 81/2 • 276 Pages • Paperback"
Finished it up last night. Writing my review today. It was pretty encouraging!